Martha Hicks-Robinson of Montpelier, Vt., posed with Boston police officer Steve Horgan outside Fenway Park before the start of Game 1 of the World Series. A heavier presence and traffic regulation are just some of the measures Boston police are taking to ensure that the World Series runs smoothly and safely, the department said in a security briefing Wednesday night. “We’ve enhanced the security package around the stadium,” said Superintendent-in-Chief Daniel P.Linskey outside Fenway Park. “We’ve just put some more officers out for visibility. Obviously, we’ve got a lot more foot traffic, a lot more vehicular traffic, so we’ve expanded our footprint around Fenway Park. Just before the start of Game 1 at Fenway Park between the Red Sox and St. Louis Cardinals Wednesday night, a sea of fans buzzed with excitement and moved fluidly through the area. 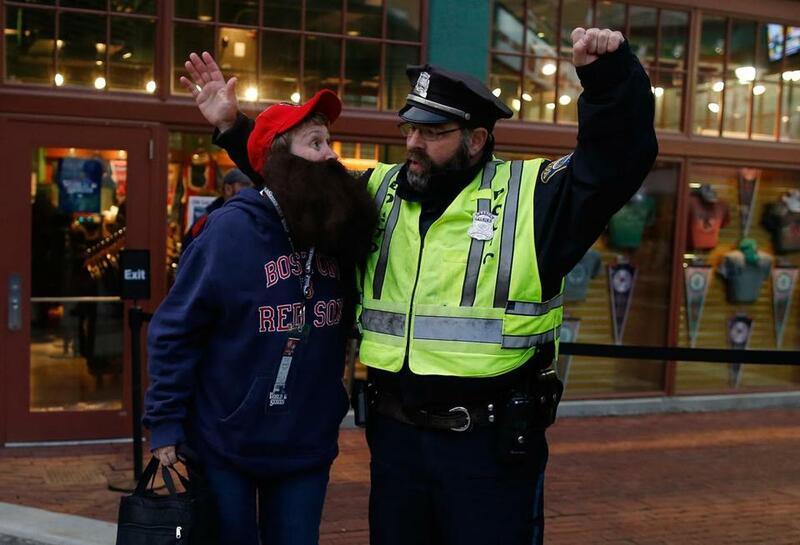 Boston police and emergency vehicles were woven into the crowds of beards and B’s entering the park and surrounding establishments. Linskey said the department is not expecting massive crowds during the first few games. Traffic will be regulated around the Fenway area, he said. After fans get inside the stadium, police will restrict traffic in and around the area so vehicles will not be anywhere near the ball park. Police could be seen throughout the moving crowds Wednesday, and at MBTA stations around the Fenway area. Special Operations police vehicles, along with standard police cruisers, cut off streets and flashed blue lights while officers directed heavy traffic in the area. The department has specific procedures when dealing with “unattended packages,” which are common at big events like the World Series, said Linskey. Linskey said the commanders plan to meet Thursday afternoon to discuss what went well Wednesday and what needs to be adjusted for later games in the series.